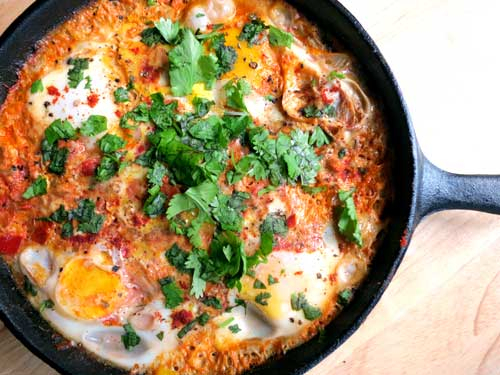 Shakshouka kind of looks like an egg pizza, doesn’t it? The combination of eggs and fresh ripe tomatoes is refreshingly awesome. Roby and I eat this popular middle eastern dish all the time because it’s easy to make (one-pan meal) and it’s super tasty. 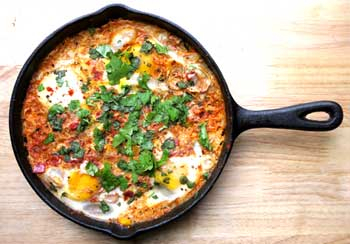 Shakshouka is made by poaching eggs in a spiced tomato sauce. It’s the perfect any time meal. When you make this dish, start by cooking onions until they turn golden and then add garlic, serrano pepper and red bell pepper. Once that’s nice and soft, add tomatoes and simmer until the sauce is nice and thick. Spice that sauce and gently crack eggs into your skillet. If you’re trying to make the dish look fancy, crack your eggs in a bowl and then gently slide them into the skillet. This way if you’re clumsy and break a yolk, you can just use another egg (and eat the broken egg yolk egg separately). 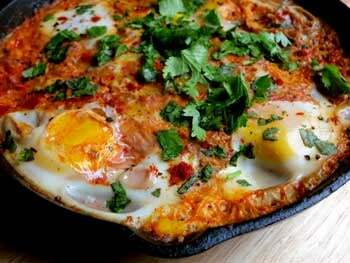 Cover your skillet until the eggs are cooked to your liking, sprinkle with a little cilantro and devour. Heat ghee in skillet over medium heat. Add onion and stir occasionally until onions begin to turn golden brown – about 10-15 minutes. Once onions soften, add garlic and Serrano pepper. 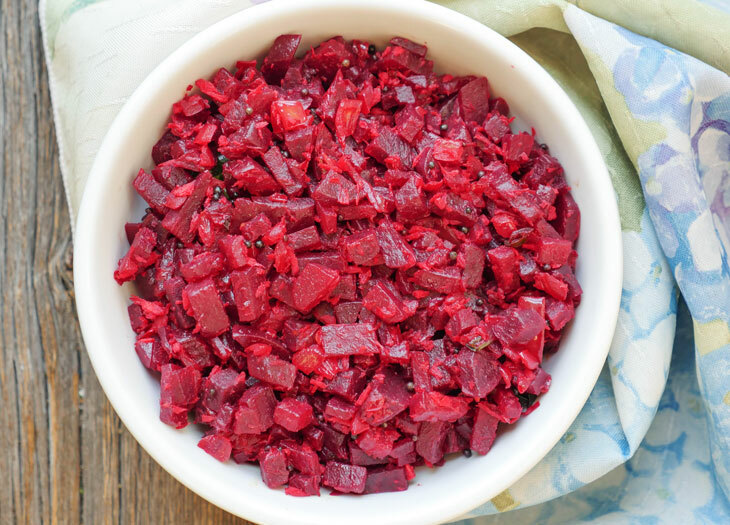 After a few minutes, add red bell pepper and reduce heat to low. Cook about 10 minutes, stirring occasionally. Add spices, stir and then add tomatoes. Gently crack eggs into skillet, season top of eggs with salt and pepper and then place a cover on top of the skillet for about 5 minutes or until the eggs are cooked to your liking. Sprinkle with cilantro if desired and serve. 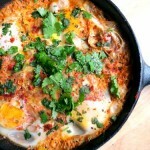 I love Shakshouka! I usually add a bit of harissa for an extra kick. Great dish. Omg yum!! I am all about one pan brunches right now and this looks amazing!! I love anything that requires little clean up 🙂 It’s super tasty! Wow. This was amazing! I used a couple pieces of bacon to sauté my onions because I didn’t have ghee. Inccorporated the bacon pieces in the sauce. Will make this dish again and again. Thanks! I made this last night and it is awesome. I actually made three helpings as make aheads for lunch and dinner. Instead of serrano peppers (I didn’t have any on hand) I used my own dried/smoked jalapenos and added a teaspoon of garam masala. 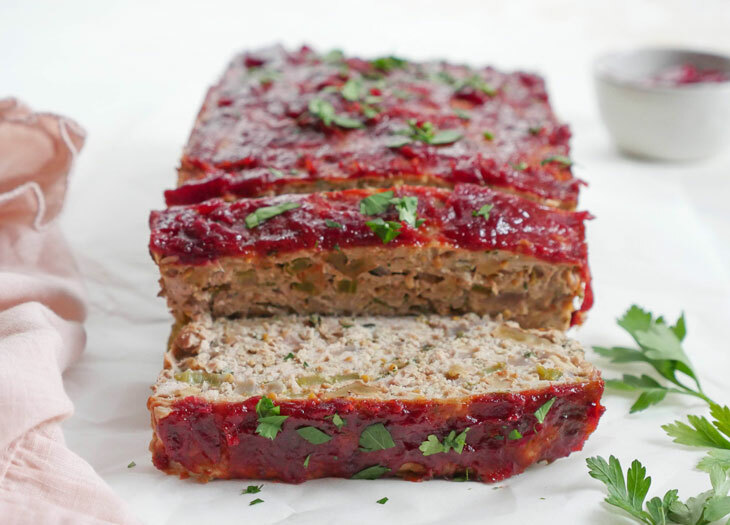 This is a great recipe – thank you for sharing! I just cooked this up and added some chorizo and mushroom. It was divine! Thank u for the recipe, I’ll be using this one as my weekend breakfast. Hi Holly, thanks for letting me know – I made the fix. Chopped was right 🙂 Glad you liked the recipe! This is a favorite in our house, but we call them eggs in purgatory. We change up the flavor of the sauce, too. Mexican, Italian or Curry, usually. 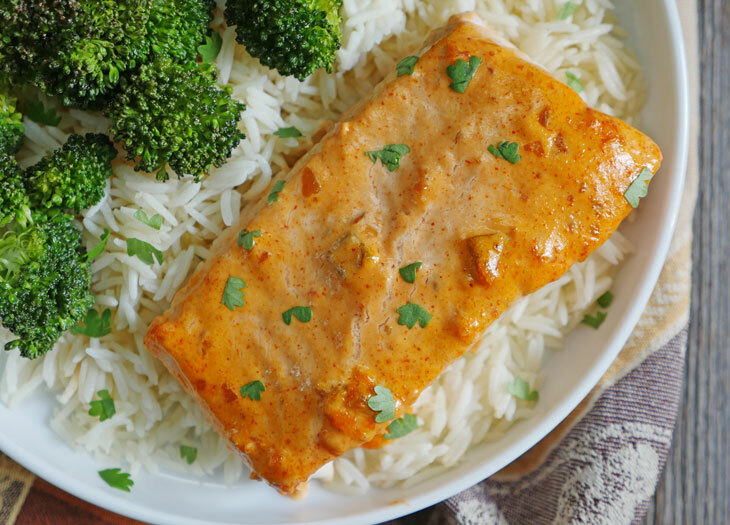 Love that you included your recipe for harissa! I’ve always just purchased the stuff, but it looks so easy to make!